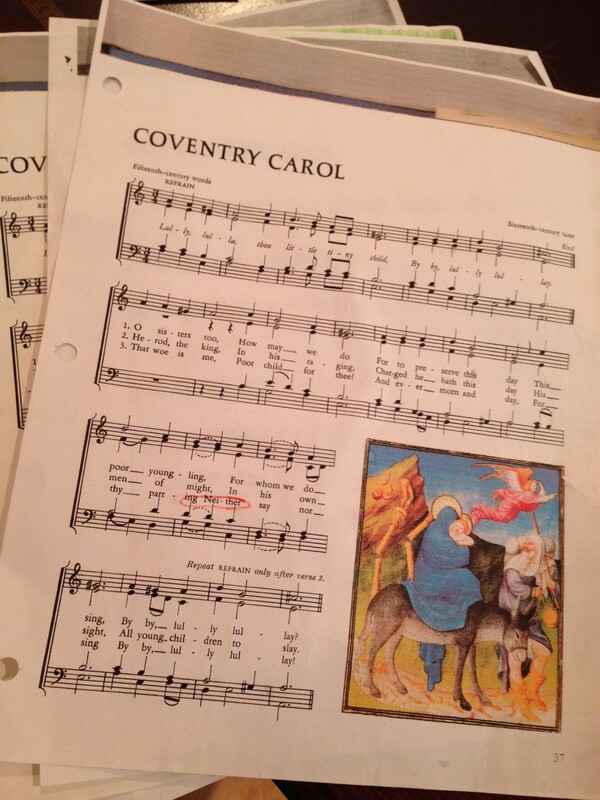 Clump #230: Basement paper piles shredded and recycled; Coventry Carol sheet music refiled. Hello wonderful readers. Not only is today the first day of 2015, it’s also the second anniversary of Clump A Day! Amazing. I am living and typing proof that anyone can fulfill any New Year’s resolution, even one as outlandish as this: a disorganized technophobe publishing on the web and clearing a clump of clutter every day. Yes, I’ve fallen off the blogging wagon more than a few times, but have gotten back on and kept rolling. I very much hope you enjoyed wonderful holidays. I have been savoring the closeness of family the most. Our older daughter was here and gave us the clearing of clumps as a Christmas gift. My husband put her to work in the basement with some very old piles of paper. The one below was spared shredding. It was obviously a school project for our younger daughter, a menu, possibly created to use spelling words? 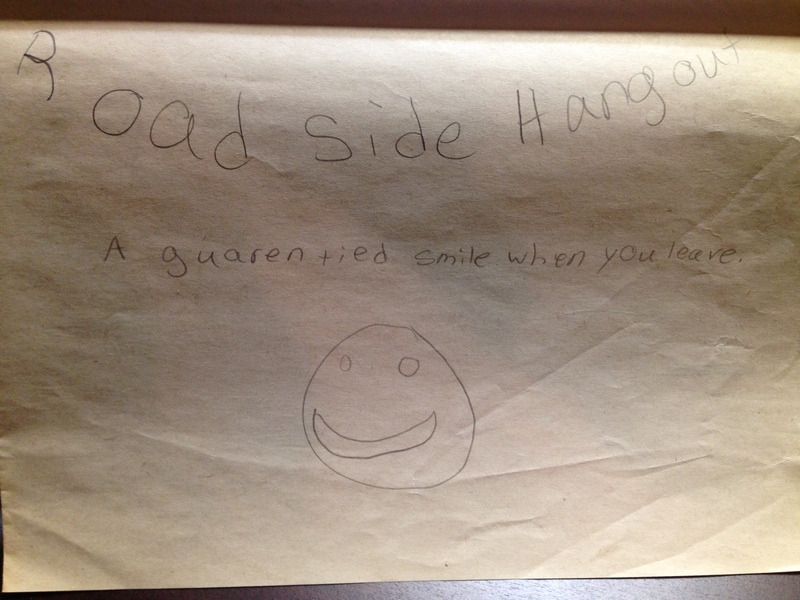 “A guarentied smile when you leave” was her restaurant’s slogan, which could mean its customers were happy to leave :-). Inside, menu items included “roast beef – the savory and tender meat matched with the stupendous flavorful juices will brighten any horrendous day.” And, “green beans – these crispy fresh green beans with a lively bright color will give you a reasonable amount of the important folic acid that you need.” Sold! Ah, some things are just too good to throw away. But many, many more were not. I placed newspapers and flyers strategically over the bags in the foreground, below, to stabilize the shredded paper within. And just when they should be running through the song so we can get in the car and go, a hunt for the sheet music ensues. 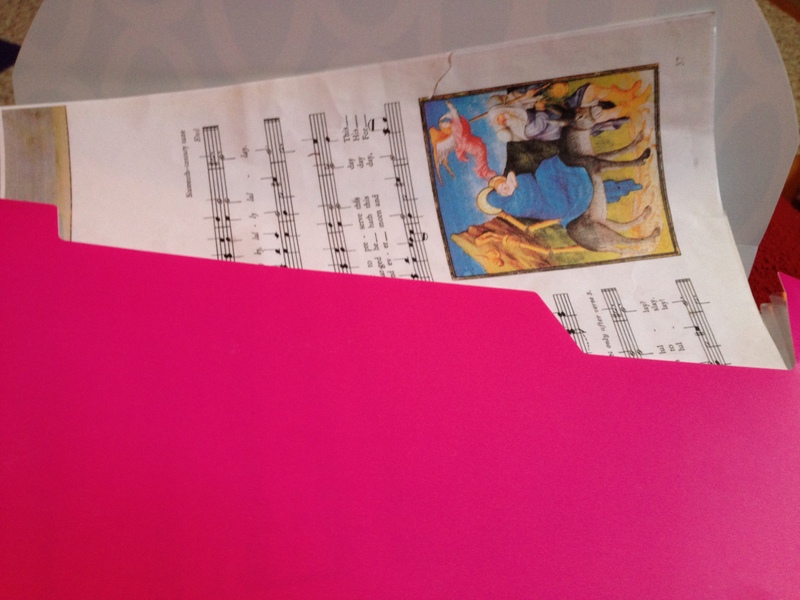 This year, for the first time, I said, “I know exactly where it is.” I had made the culling of sheet music a clump sometime last year. 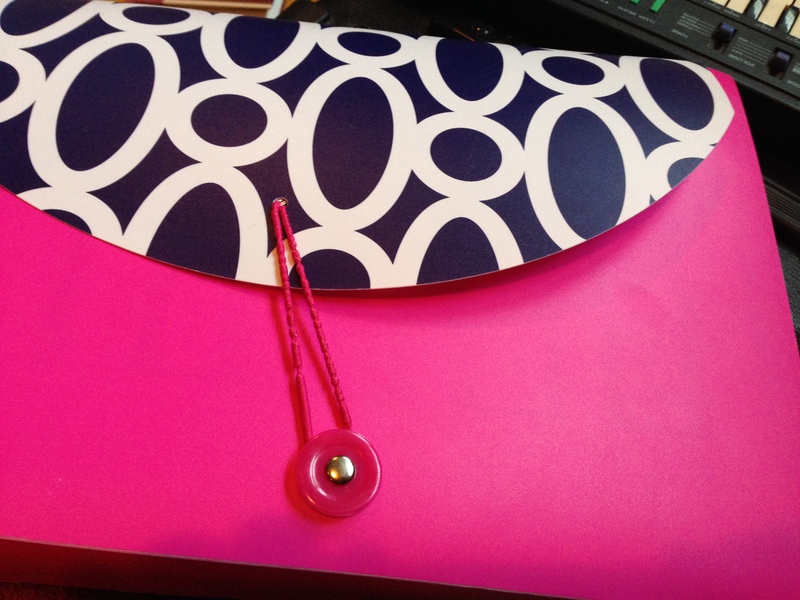 “It’s in the pink folder with the whole notes on top.” And, lo and behold, there it was. And furthermore, there is where it was returned. 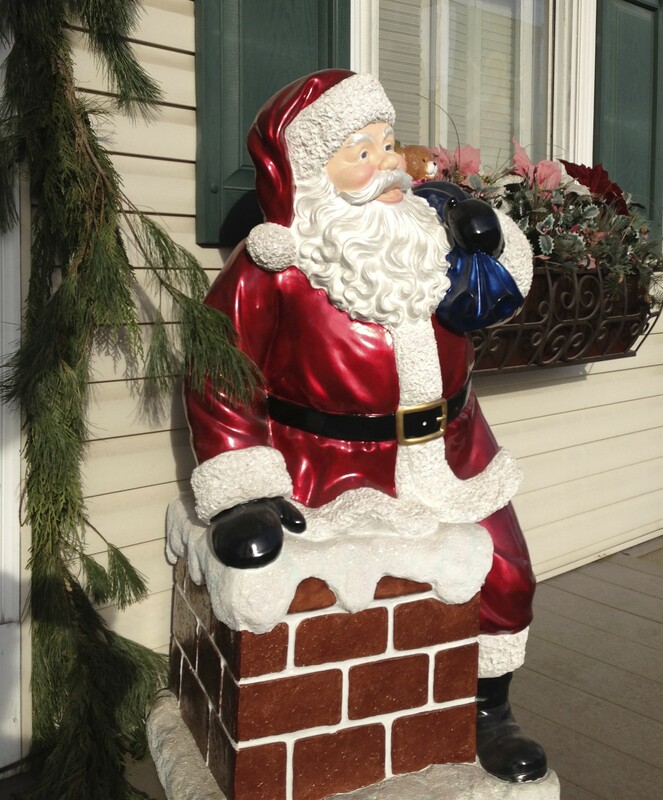 Without the early Christmas to-do list work that this blog inspired, I would have really been in trouble. I had received some bad news about my mom’s health (she seems to be doing better) and about two dear friends during the lead-up to Christmas. I was driving to Lancaster County much more often, and even at night. 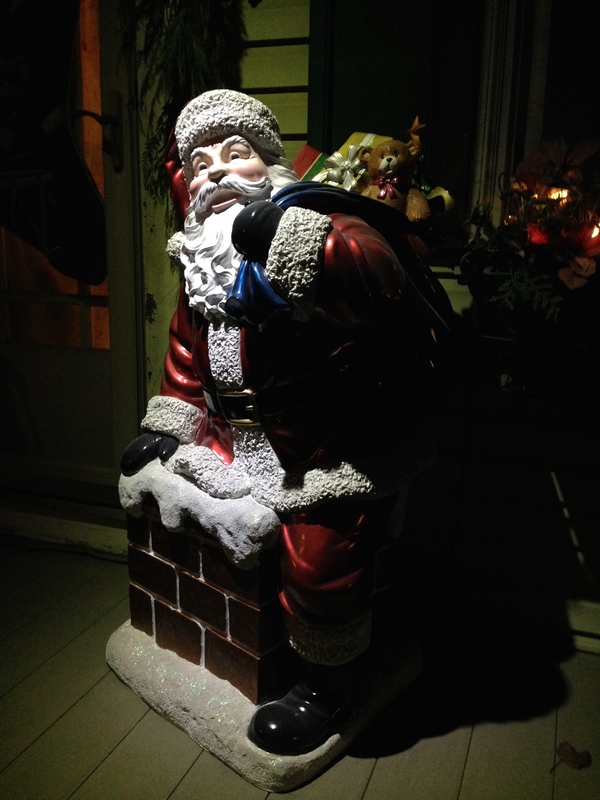 The Santa I had photographed last year (at top) looked so different in the dark, as if he had come alive and was ready to go. Me too! Wishing you the very best of health and happiness in the New Year, and may your resolutions bring you comfort and joy.